Baton Rouge NAACP President Demands Arrest of Police Officers Who Killed Alton Sterling | Democracy Now! president of the Baton Rouge branch of the NAACP. African-American studies professor at Morehouse College, author of Nobody: Casualties of America’s War on the Vulnerable, from Ferguson to Flint and Beyond. retired detective with the New York City Police Department. He is also a board member of the Amadou Diallo Foundation. In Baton Rouge, Louisiana, protests and vigils are continuing for a fourth day following the death of Alton Sterling, who was fatally shot by police early Tuesday morning. Sterling was a 37-year-old African-American father of five. The two officers involved are both white. Bystander video shows Sterling was pinned to the ground by the two police officers. One of the officers then shoots Sterling at least twice. We speak to Michael McClanahan, president of the Baton Rouge branch of the NAACP, who is demanding the arrest of police officers Blane Salamoni and Howie Lake II. AMY GOODMAN: In Baton Rouge, Louisiana, protests and vigils are continuing for a fourth day following the death of Alton Sterling, who was fatally shot by police early Tuesday morning. Sterling was a 37-year-old African-American father of five. The two officers involved in his death are both white. Bystander video shows Sterling was pinned to the ground by two white police officers. One of the officers then shoots Sterling at least twice. The audio then captures the sound of multiple additional gunshots. Sterling is at least the 38th person killed by Louisiana police since 2015. The Justice Department has announced it will investigate the killing, which has sparked two days of protests. On Thursday, President Obama addressed the shootings of Alton Sterling and Philando Castile in Falcon Heights, Minnesota, where he is, in Warsaw, Poland. PRESIDENT BARACK OBAMA: When incidents like this occur, there’s a big chunk of our fellow citizenry that feels as if, because of the color of their skin, they are not being treated the same. And that hurts. And that should trouble all of us. This is not just a black issue. It’s not just a Hispanic issue. This is an American issue that we should all care about. All fair-minded people should be concerned. AMY GOODMAN: Joining us now from Baton Rouge, Louisiana, is Michael McClanahan, president of the Baton Rouge branch of the NAACP. Still with us, Graham Weatherspoon, retired New York City police detective, and Marc Lamont Hill, author of Nobody: Casualties of America’s War on the Vulnerable, from Ferguson to Flint and Beyond. Michael McClanahan, thanks so much for joining us. I first saw you on TV in Baton Rouge at the news conference where people had gathered to decry the killing of Alton Sterling. Can you talk about what you understand happened and what you’re calling for right now? What happened on Tuesday? MICHAEL McCLANAHAN: Good morning. Thank you for having me on. As I appreciate what happened was Alton Sterling was doing what a lot of young brothers do, as entrepreneurs—sell CDs, what we call hustle work, to provide for their families. And he had been doing that a long time. And while on the—while there, I understand that the police department dispatch office received a call that the gentleman, Alton, was brandishing a gun. They came on the scene. Within a few minutes of arriving on the scene, they tased, jumped on and shot this gentleman without giving him a reason why they’re stopping him, without doing any of the training that I’ve known them to do in terms of where you confront the community. And now, after that has happened, you see many in the community coming out saying, “That had happened to me. I was accosted. I was unlawfully detained and beat up,” and what have you. So, this is years of frustration, fear and, as your guest said, denial on other parts that stuff like this just do not happen. AMY GOODMAN: The police say a call came in just after midnight. They now have identified a homeless man who made this call, who said Alton Sterling had a gun. Now, you’re allowed to have a gun in Louisiana, right? Open-carry laws. MICHAEL McCLANAHAN: Well, you are. You are allowed to carry a weapon. I don’t know to the extent that he had a weapon. But clearly, if the police officers and their training dictated that they were going to arrive on the scene which a weapon might have been involved, that there are certain things that they’re trained to do. From what I gather, from my looking at the video, none of that took place. AMY GOODMAN: What are you calling for right now, Mike McClanahan? MICHAEL McCLANAHAN: Well, there’s a—there is a culture in the Baton Rouge Police Department that has allowed this type of action to happen for years, for decades. I’m calling for this culture to be rooted out. That means police officers who conduct this type of action need to be brought to justice on other cases. I call for the mayor to step down and for the police chief to resign, because the mayor appoints the police chief, really controls the police chief. The police chief is a good friend of mine. But friendship in this type of business has to step aside for the people’s business, which is more important. And I’m asking those that are involved—the police chief and the mayor—to resign, so others can come in, root out this evil, root out the 1 percent of bad police officers that cause these type of harms in our community to be pushed to the side, to be kicked out of the department, and those that want to take serious the business of serve and protect to get about the business of serving and protecting. AMY GOODMAN: And what do you think should happen to the police officers who killed Alton Sterling? MICHAEL McCLANAHAN: I’m glad you asked, because anyone that commits a crime, anyone that commits an act such as the act they committed, would be arrested, put in jail, and the process of justice would take place. These officers should not get a free pass. They should be arrested. They should be charged, and let the system work. If it works for some, it should work for all. No one should be exempt from the system. AMY GOODMAN: What about that, Marc Lamont Hill? And I also want to ask former police officer Graham Weatherspoon about arresting officers. MARC LAMONT HILL: Yeah, well, you know, I come out of a prison abolitionist tradition, and so obviously my long-term vision for what law enforcement and justice should look like is not tied to mass incarceration, is not tied to caging people, it’s tied to things that are restorative. That said, within this context of this system at this moment, police cannot be above the system. You cannot have a system that criminalizes and incarcerates its citizens, but not the agents of the state when they violate those very same laws. We see—excuse me—we see time after time after time that when law enforcement kills us, nothing happens. If it’s on tape, nothing happens. If it’s not on tape, nothing happens. At some point, when need to engage in a process of transparency, but also critical distance. For me, that means citizen review boards, civilian review boards. That means having some kind of mechanism to police the police, to oversee the police, to make sure that they get brought to justice in the same way that citizens do. GRAHAM WEATHERSPOON: No, it was. It was enforced. I know people that were terminated. But the thing is this, that a police officer has to be held to a higher standard. You cannot use an excuse, “I had a bad day,” this “I was afraid.” No, if you’re afraid, stay home with mommy. This is not a job for people that are scared. Yes, everybody goes out and wants to come home at the end of the day. The life of the police officer is no more valuable than the life of the citizen. MARC LAMONT HILL: That’s right. AMY GOODMAN: And the men who were responsible for the death of Alton Sterling were police officers Blane Salamoni and Howie Lake II. In 2014, Lake was placed on paid leave after being involved in the shooting of another African-American man, Kevin Knight. Do you know these police officers, Mike McClanahan? MICHAEL McCLANAHAN: I don’t know them, but I know one of the—Salamoni, I know his family. I’m aware of his family, aware of his history. But you’re right. To speak to your guest’s comment, officers are trained. There are certain things that they are trained to do that ordinary citizens don’t know. They’re trained. They are always trained. There’s always updated training, retraining. 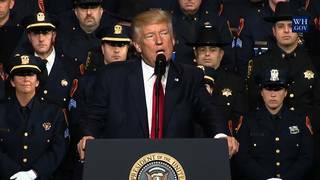 And if you leave home with the intent to commit crime or heinous acts, you’re no longer a police officer, you’re a criminal. And as such, you need to be treated as such.